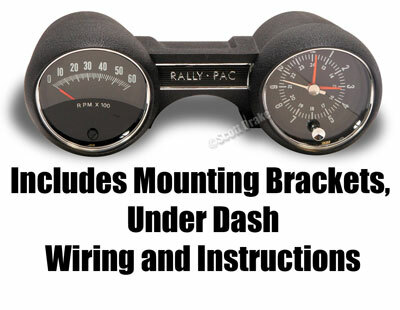 Includes mounting bracket, under dash harness and easy to follow, detailed instructions for a simple installation. For use on car equipped with long style speedometer and warning lamps. Correct Black Wrinkle finish. All of our Rally Pacs feature back lit dial faces for improved visibility at night. Our clocks feature precision quartz movement, and our tachs are the air-core movement type. Each are individually tested to ensure accurate time and RPM readings. Each unit is fully inspected after assembly to ensure years of trouble free operation.